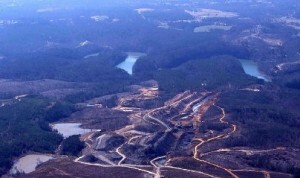 The Warrior Coal Field lies underneath the majority of the Black Warrior River watershed. This coal field has been the largest, southernmost coal-producing area in North America according to the Geological Survey of Alabama. Coal mines from the past have left a dirty legacy for our generation and future generations to clean up. These old coal mines were not properly reclaimed, resulting in hundreds of acid mine drainage (AMD) sites. AMD sites pollute streams with heavy metals, sediment, and acids. Many AMD sites can be spotted easily due to chemical reactions involving iron, which may cause the stream to appear neon orange. AMD sites are very costly to clean up. There are around 95 active coal mines located in the Black Warrior River watershed. Strip mining (a.k.a. surface mining) and longwall mining (a.k.a. underground mining) are the methods of choice for coal extraction in Alabama. 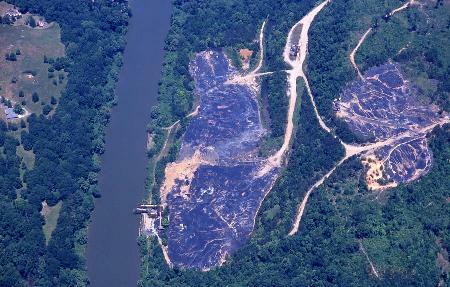 As a result, many Black Warrior streams are impaired by sediment laden with heavy metals. Coal mines transform the landscape and alter streams forever. Coal is transported by truck, train, and barge to be used for power production and by the coke and steel industries. Power plants that burn coal for the production of energy pollute the air and ultimately the river. Alabama Power Company’s Gorgas Steam Plant on the Mulberry Fork, Miller Steam Plant on the Locust Fork, and the Greene County Steam Plant on the lower Black Warrior River are old plants that need to have their pollution controls updated. APCO’s parent, Southern Company, has lobbied hard in Washington, D.C. for less stringent air quality regulations. Coke plants and steel industries that use coal and its byproducts are notorious polluters, known for discharging heavy metals, acids, and petroleum products. The entire picture of coal is a mostly untold story. From the mining of coal to the use of its products, a long trail of pollution can be followed. As consumers, we can do our part by using less energy and using energy efficient appliances. Every time you leave on household appliances — perhaps sometimes unnecessarily — remember that you are at least partly burning coal, an extremely dirty form of power. For the journal article “Modes of occurrence of mercury and other trace elements in coals from the warrior field, Black Warrior Basin, Northwestern Alabama” click here. For information about coal burning power plants in the Black Warrior River watershed, click here. For a map of Alabama’s coal geology, click here. For historical information about coal mining in Alabama, click here. For information about citizens’ rights under Alabama surface mining laws, click here.